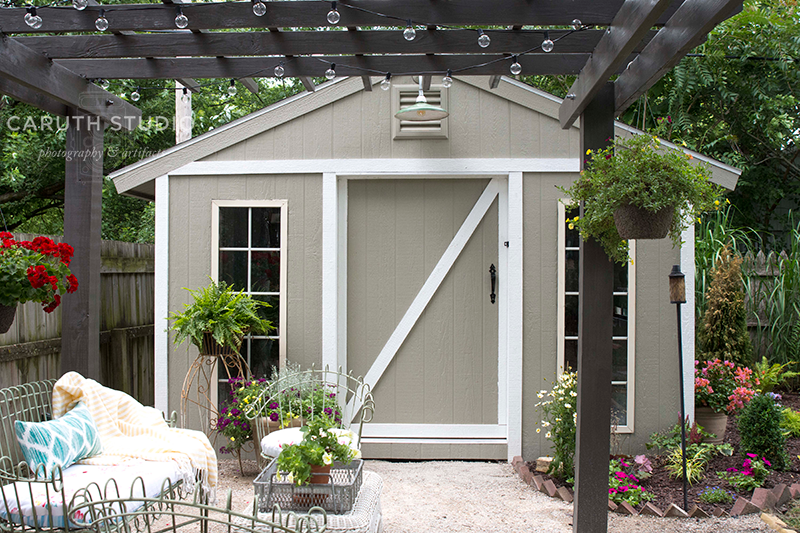 Can’t find a pre-fab garden shed that tickles your fancy? Get a structure that graces your landscape by building it yourself. Last year, we created a lovely pond in this backyard (see how here). But that left the rest of the garden with a sort of inferiority complex (along with a feeble path that leads nowhere). So we created a plan to fill the remaining landscape with areas worthy of a visit. With help from Lowe’s Home Improvement Stores, we decided to build a 12 x 12-foot she-shed, a patio and pergola, and landscape a new border at the back of the lawn. Every structure starts with a good foundation. Ours will rest on treated 12-foot 4×4-inch runners that are leveled on concrete blocks. Narvas digs in to create a base. He fills a pit with rock, tamps it down, then, places the block on top. Three blocks in a row will provide the base for each treated runner. After placing the runners and checking that they’re level, Narvas builds a frame for the floor. Two 12-foot 2x4s form the sides, while two 2x4s cut to 11 feet 9 inches are nailed to the ends to form the top and bottom of the frame. He checks the level at each stage and measures the frame to ensure that it’s square. To do that, he measures from one corner of the frame to the opposite corner, then, repeats it for the other corners. If those two measurements are equal, the frame is square. Toenail the frame to the runners with framing nails to keep it secure. Narvas cut the floor joists to 11 feet 9 inches and places them in the frame on 16-inch center spacing. Hannah and Narvas make sure they’ve got the joists placed just so on both sides of the frame. Then, he secures them to the frame on both sides and to the runners with framing nails. Using 23/32-inch subfloor sheets, Narvas covers the joists. Three full-size sheets are placed side-by-side on the joists with the center sheet at the front header of the frame and the two side sheets at the back footer of the frame. Two sheets are cut into 4×4-foot pieces to fill in the 3 open spaces that remain. The leftover piece will be used later for roofing truss gussets. While all this is going on, we’re also working on creating the border that will help tie our new construction into the landscape. After we’ve laid out the shape of the border, Narvas demonstrates the best way to use the tiller. He used the equipment to break up the soil, I got to go in later and remove all the grass clumps and weeds. Our ship came in when we discovered the local landfill was giving away loads of compost. One quick visit and we’ve got enough to enrich the entire border. The staff at the landfill used a front-end loader to fill the pickup bed. Unfortunately, at the other end, we’ve got to cart to the backyard the old fashioned hands-on way. The first thing we did was transplant a nice little purple plum tree that was too close to our new shed. Then we added compost all around the newly tilled bed. Hannah uses the tiller to work the compost into the soil and give it a better texture overall. We selected some easy-care shrubs and perennials as the foundation for our design. We’ll add annuals for quick fillers and color but as the border matures from year to year the foundation plants will take over. We figure out what goes where along the shed side and front corner but we’ll hold off putting them in the ground until the walls are up and the roof is on. Kurtis starts by planting the larger shrubs, follows with the smaller ones, like this weigela, then adds the perennial plants, adjusting the placement as needed. Finally, the annuals are planted in the spaces between and along the edge of the border. Things get moved around while the design takes shape and color, size, and bloom time are taken into consideration. In our next post, the shed takes shape! Thanks to our project sponsor, Lowe’s Home Improvement Stores, for making this series possible!